The public debt is the total amount owed by the Federal Government, both domestic and external. Since 1997 the Federal Government debt (public debt) has steadily increased. 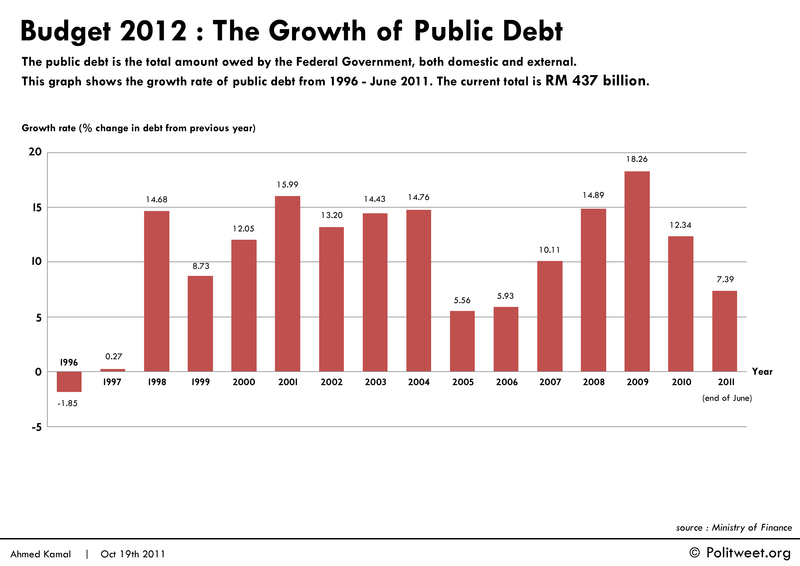 The latest figure for June 2011 places the debt at RM 437 billion. Not only has the total debt been increasing, but the rate of growth has for the most part remained high. It crossed RM100 billion in 1998. It crossed 200 billion in 2004. It crossed 300 billion in 2008. It crossed 400 billion in 2010. That is an exponential growth rate. The average growth rate from 2005 – 2010 was 10.6%/year. If the current growth rate holds steady at 10%, the public debt will cross RM 1 trillion by 2020. 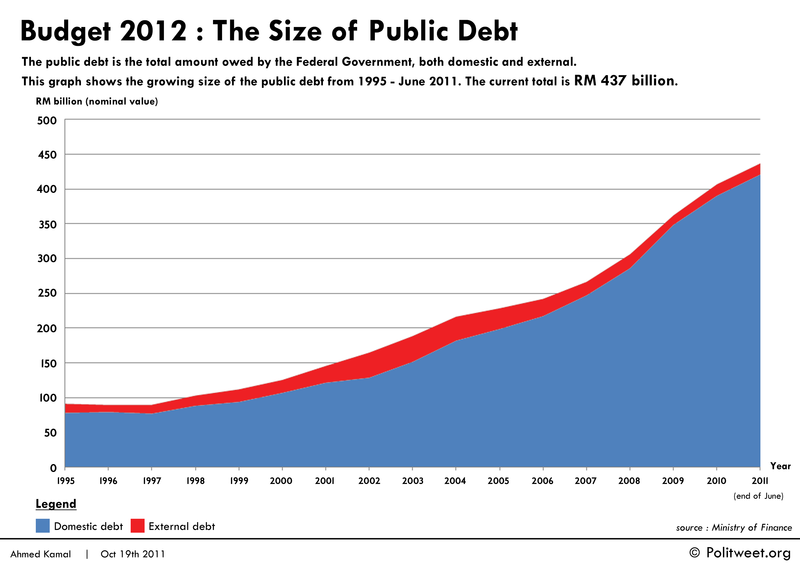 This chart shows the size of the public debt from 1995 – 2020, based on an estimated growth rate of 10% per year from June 2011 onwards. 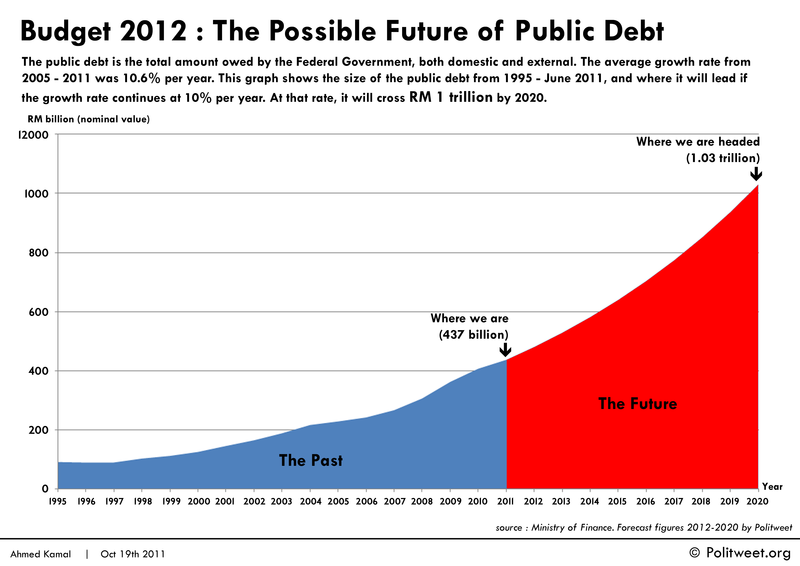 This serves as an illustration of the possible future of the public debt based on recent trends. While the debt ceiling ensures this will not happen easily, this chart should make it clear that recent trends are not sustainable for the future. Economic reforms are needed to drive up revenue, lower expenditure or both. The 1 Trillion figure is too far in the future to be proven valid or invalid, so there is no point in debating that. A 10% growth per year is a simplistic approach, but my intention is to get people to take notice and start asking the government and opposition how their economic policies will affect the debt. If the public debt increases were largely due to development expenditure (true in most years) then it should ultimately be paid off by the revenue brought in by the development. But we have had larger increases in operating expenditure that have helped contribute to the debt. Our government has a tendency to increase operating expenditure hand-in-hand with revenue increases, if not through planned budget increases then via Supplementary Bills. The most recent IMF forecast for 2016 estimates government revenue to be 293 billion, and the gross government debt to be 695 billion. This is lower than the 704 billion shown here. Nett debt would be smaller, lowest I can estimate based on IMF’s earlier figures is 670 billion. That is still higher than my 2015 estimate. to see that the 2008 – 2009 recession was the worst period, where the debt increased by 18.26%.A lower growth rate can be achieved by the government either by increasing revenue or lowering expenses. (*) Domestic debt is debt owed to creditors within the country (citizens). Examples are treasury bills, securities (e.g. EPF), and other borrowings by the government. (*) External debt is debt owed to creditors outside the country. Examples are external market loans in foreign currencies, and external bilateral and multilateral project loans. How has the government managed the budget surplus in the last 16 years? This graph shows the budget surplus trend as a percentage of GDP from 1996 – 2012. Since 1998 there has been a budget deficit. A budget deficit occurs when the government spends more than it receives in revenue. Deficits are financed by borrowing, which increases public sector debt. This is not necessarily a bad thing, as government spending can help stimulate economic growth and benefit society through welfare, healthcare and measures dealing with job loss and owning property. This can become necessary during a recession. What is important for voters is ensuring that the government works to reduce the deficit, so it does not remain high or increase over a sustained period. This can be seen from 2000 – 2007. The original budget deficit estimated for 2009 was 3.6%. It ultimately turned out to be 7.0%. Why? In 2008/2009 there was a global recession and Malaysia experienced negative GDP growth and lower projected revenue. The export-focused manufacturing sector was the hardest hit. The government implemented stimulus packages (RM 67 billion) and other measures to help the economy. This brought the economy from a negative GDP growth of -1.6% in 2009 to a positive growth of 7.2% in 2010 (5.4% when compared to 2008 GDP figure). Barisan Nasional has allocated RM 232.8 billion for Budget 2012, and aims to bring the deficit down to -4.7% of GDP. 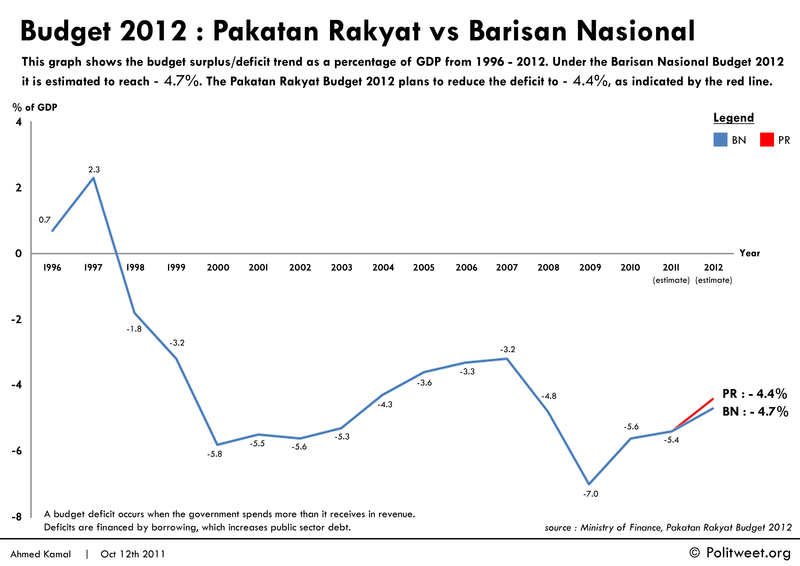 Pakatan Rakyat has allocated RM 220.5 billion for Budget 2012, and aims to bring the deficit down to -4.4% of GDP. This graph shows the allocation in spending in both budgets across 7 different areas. Barisan Nasional (BN) allocated RM 232.8 billion. Pakatan Rakyat (PR) allocated RM 220.5 billion. The previous 2011 Budget was 213.9 billion. The percentage gap in spending priorities is greatest in National and International Affairs, Education, Talent and Employment and Community Wellbeing. This was achieved by reducing the allocation in other areas, primarily National and International Affairs. 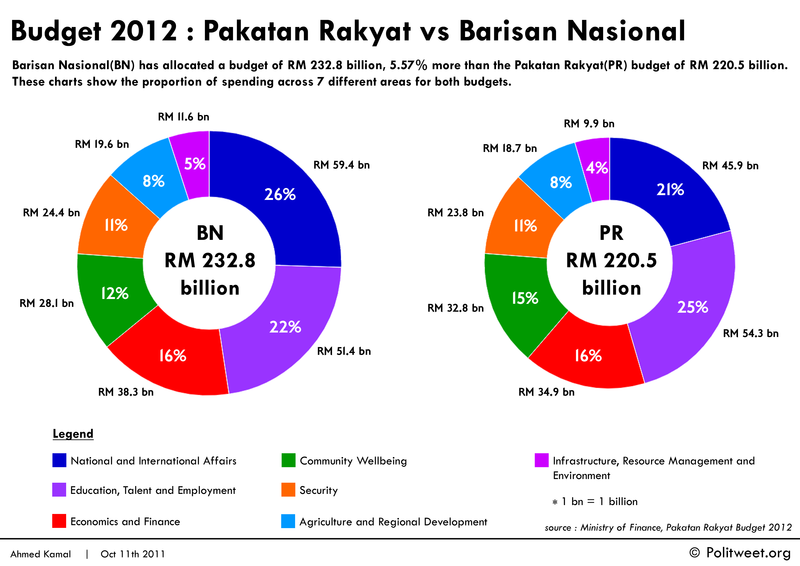 How does the Pakatan Rakyat Budget compare with the Barisan Nasional Budget for 2012? 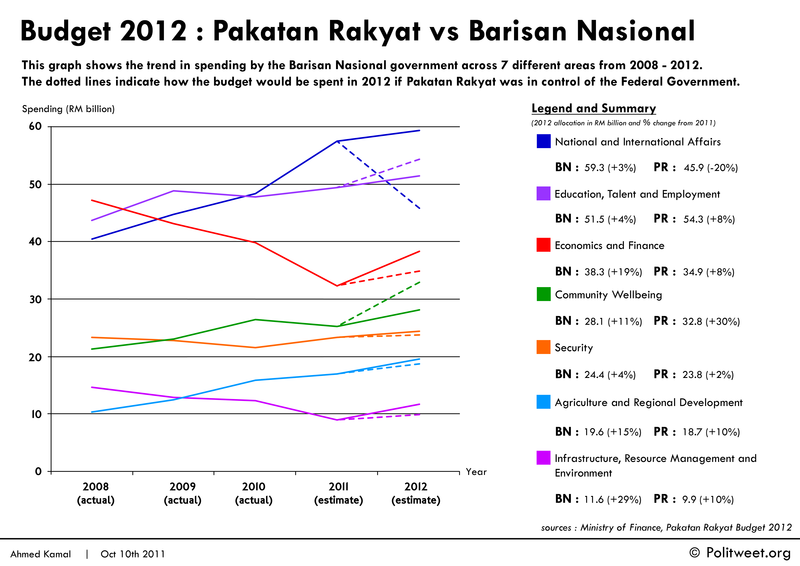 This graph shows the trend in spending by the Barisan Nasional government across 7 different areas from 2008 – 2012. The dotted lines indicate how the budget would be spent if Pakatan Rakyat was in control of the Federal Government. The gap in spending priorities is greatest in National and International Affairs, Education, Talent and Employment, Economics and Finance and Community Wellbeing. Pakatan Rakyat focused spending on increased Education, Talent and Employment and Community Wellbeing and a 20% reduction on National and International Affairs. Barisan Nasional focused spending on increased Economics and Finance, Agriculture and Regional Development and Infrastructure, Resource Management and Environment. How have government spending priorities changed for 2012? 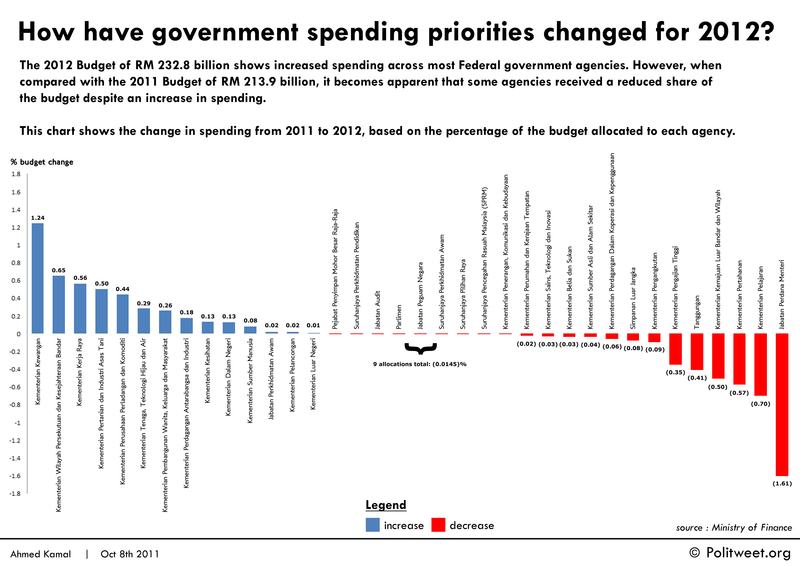 The 2012 Budget of RM 232.8 billion shows increased spending across most Federal government agencies. However, when compared with the 2011 Budget of RM 213.9 billion, it becomes apparent that some agencies received a reduced share of the budget despite an increase in spending. For some allocations (e.g. Simpanan Luar Jangka/Contingencies Reserve) that is to be expected. But this visualisation helps analysts see which agencies experienced the biggest shifts in spending. It also serves to highlight any incongruity between the increases in dollar figures versus the proportional change in spending. Take Education and Security for example. For Education, the total increase for the Ministry of Education (Kementerian Pelajaran) and Ministry of Higher Education (Kementerian Pengajian Tinggi) is RM 1.8 billion. For Security, the total increase for the Ministry of Defence (Kementerian Pertahanan) and Ministry of Home Affairs (Kementerian Dalam Negeri) is RM 1.03 billion. Looking at the dollar figures, it would seem that both spending areas have received substantial increases. While that is true, from the chart it is clear they have a lower priority. 2) The Ministry of Higher Education received an increase of 290 million. 3) The total increase is 1.8 billion. 4) In 2011 they took up 22.6% of the budget. For 2012 they have been given 21.55%. 5) Despite the increase of 1.8 billion, it’s a loss of -1.05% since 2011. 2) The Ministry of Home Affairs received an increase of 1.1358 billion. 3) In 2011 they took up 10.92% of the budget. For 2012 they have been given 10.47%. 4) That is a loss of -0.45% since 2011. 5) Individually the Ministry of Defence has reduced -0.57%, whereas the Ministry of Home Affairs increased by 0.12%. In summary, both areas have received a reduced share of the budget, and the allocation share for Education has reduced at a greater rate than the allocation for Security.